On Sunday, April 29, 2012, members and friends of Ubar Grotto converged at the Olympic Skating Center in Enola, PA, to watch the home opener bout of Harrisburg Area Roller Derby. HARD, as it’s more commonly called, is an all-women amateur athletic organization that competes regionally in the super competitive sport of roller derby. While we can’t go into all of the rules of derby here, we can tell you that this isn’t the old fashioned stage show derby. These women are true warriors, taking hits and dishing them back out with equal vigor. Members started arriving around 3:30 PM to enjoy a fantastic tail gate put together by Prophet Tracy Bitner. Ubar, known for going all out, had a grill and a full spread for all of the Prophets in attendance. The food was excellent and the fellowship was just as strong. After much socializing at the tailgate, the bout was ready to start inside with the girls fired up and ready to skate. The rink was abuzz with energy as the announcers whipped the crowd into a frenzy, ready to cheer on the Fallout Femmes of HARD in their lime green jerseys. The competition was the Charlottesville Derby Dames, who were much outnumbered in the fan department. The first half was a barn burner, with the Femmes down more 30 points, but thanks to a couple of strong jams, they came back to within only a couple of points of their opponents. However, the close score wouldn’t last long, as the Femmes were down severely by the end of the first half. 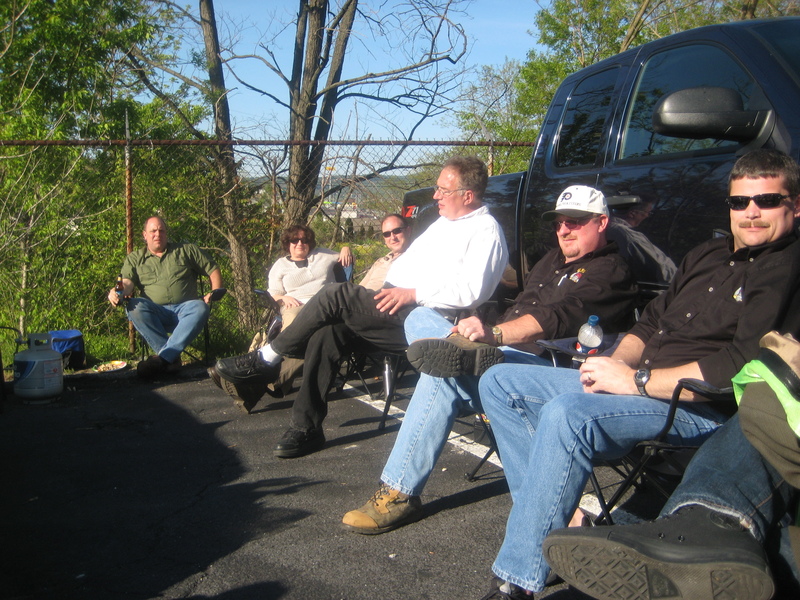 During half time, the Ubarians retired to their tail gate and had a quick snack and a beverage or two, before returning to the flat track for the second half. Unfortunately, the bout didn’t get much better for the Femmes, as they fought through several tough jams, but were just not able to get the points they needed. At the end of the night, the Charlottesville Derby Dames pulled out a big victory. But, as our charge at fezzing says, winning isn’t everything. The ladies skated well and did their very best and the Prophets of Ubar are still proud to be one of their official sponsors. As a sidebar, for those who wonder what we get out of sponsoring derby, at half time were approached by a Master Mason who was attending the bout. He asked about how to join Ubar and is interested in membership. Not only does the Grotto have great fun at the bouts, but we turn every event in to a recruitment opportunity! Thanks to the all of the folks at Harrisburg Area Roller Derby for rolling out the red carpet for the Ubarians and we look forward to your next match! ← A banner day at Ubar Grotto!